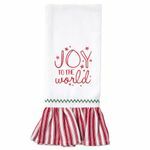 This Joy to the World silicone kitchen spatula from Brownlow make a great Christmas gift for family and friends. This red and white designer kitchen utensil will look great in any kitchen. This vintage inspired Christmas Spatula comes tied with a cute grosgrain ribbon - ready for gift giving. The back of the spatula has a handy printed measurement table. The handle is made of wood.